Pregnancy can sometimes come with its own unique physical issues for a mum to be. I have been working with clients who have conditions ranging from Sciatica, Abdominal Separation (Diastasis Recti) to pelvic girdle pain (PGP) also known as symphysis pubis. Massage can help alleviate pain and discomfort caused by these conditions and kinesiology taping can play and important supporting and pain relieving role during pregnancy. Here is an illustration of some of the taping methods used. 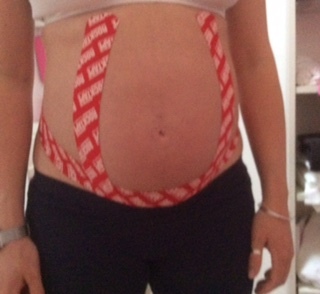 This client as Diastasis Recti and PGP so i have taped to support the abdominal muscles at the front of the body and to help stabilise the lower back and pelvis. Here is some information based on the questions I am frequently asked . Kinesiology tape is used in rehabilitation and is designed to facilitate the body’s natural healing process while providing support and stability to muscles and joints. It is a stretchy tape and so does not restricting the body’s range of motion. The tape will not restrict the babies development when used correctly . I prefer to use Rocktape and I am a certified RocDoc. Tell me about the tape and how to wear it ? The tape of 97% organic cotton and 3% nylon 6/12. The adhesive is a hypo-allergenic acrylic based adhesive and contains no latex. Rocktape contains no active chemicals or drugs. When RockTape is applied with more stretch it can be used to support areas where tissue has been strained, torn, weakened or lengthened..
A lot of pain felt when moving or contracting a muscle is generated by nerve endings in the space between the skin and muscle. As tape decompresses this space there is less pressure on these nerve endings so is reduced or stopped completely at its source. Having elastic tape stuck to your skin is also believed to stimulate receptors within the skin called Mechanoreceptors. These receptors play a part in our movement awareness (proprioception), one of the helpful effects of applying RockTape is to improve our Proprioception, which can both decrease pain and improve the way we move. The tape may act as a reminder to improve posture. Good posture during pregnancy can help with some of the problems caused by changes in the ligaments. Diastasis Recti will I always be like this? Not if you follow the correct post natal recovery advice and kinesiology tape can help with restoring you abdominal alignment. Labels: k tape for Abdominal Separation, pregnancy kinesiology taping, pregnancy rocktape, pregnancy taping, taping for Diastasis Recti, taping for pelvic girdle pain taping for PGP, taping for symphysis pubis.